Nothing more fun than hanging around friends with cameras. Tempe Lake is a great hangout kinda place. With eight photographers in a relatively small area you can count on many different interpretations of the same photo opportunity. Plus, we experimented with longer shutter speeds and ND filters to smooth water. We were given a rare opportunity to use the third floor balcony at the Tempe Center for the Arts and that gave us a very different vantage point. Tom starts us off with an overview shot from the hill to the north of the lake, precariously close to the 202 loop. ISO 500, f/9.5, at 15mm with Nikon D600 and Sigma 15mm f2.8 fisheye. Processed with Nik HDR Pro 2. Barbara got a clear shot across the lake. ISO 400, f/10, 1/160 at 250mm with Canon EOS Rebel SL1. ISO 100, f/16, 30 seconds, at 65mm with Nikon D800 and 24-120mm Nikkor lens. A 9 stop ND filter was used. ISO 200, f/11, 2 seconds at 84mm with Canon EOS 6D and 70-105mm lens. John got a gorgeous shot as the golden hour just took over!! ISO 100, f/8, 20 seconds at 50mm with Canon EOS 7D and EF28-70mm f/2.8L USM lens. Oh, you are wondering about a black and white? No problem! ISO 100, f/22, 60 seconds at 30mm with Canon EOS 7D and EF28-70mm f/2.8L USM lens. Nancy Sams is new to our group and she quickly 'caught us at play'. We like her already because she is WISE to shoot so we are all incognito with no old age skin! And no, I cannot explain the abandoned tripod. Hmmmm . . . . OK, where is Nancy Trapp? Looks like a Canon to me! LOL! ISR 100, f/16, -1.33EV, 1/100 at 250mm with Canon EOS 5D Mark III with 28-300mm lens. For some reason I think it is reassuring to see ducks on the lake. ISO 400, f/5, -2EV, 1/6 at 78mm with Canon EOS 5D Mark III and EF28-300mm lens. 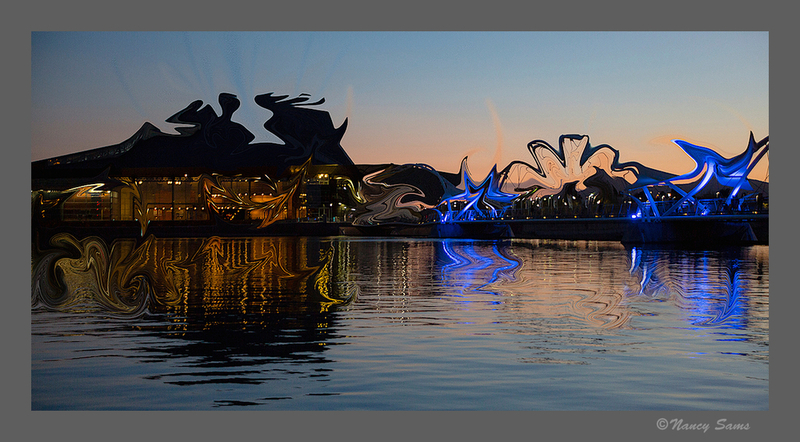 ISO 400, f/7.1, 0.5 seconds at 18mm with Canon EOS 7D and EF-S 18-200mm f/3.5 lens. ISO 200, f/11, 4 seconds at 97mm with Canon EOS 6D and 70-105mm lens. Where did Tom go? He usually is exploring a site with much more coverage than the rest of us. That is why we get home and I ask him, "Did you go with me?" 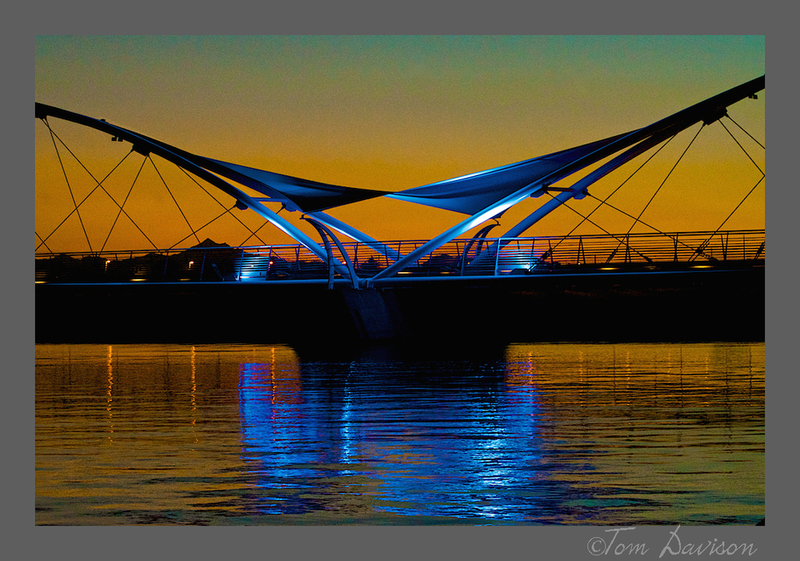 This is actually just to the east of the Tempe Center for the Arts. Nice photo opportunity, but the rest of us did not go there. The pedestrian bridge is a real photographers' opportunity. Its design begs for interpretation. It is dynamic in so many ways, from people who cross it to the light that backlights it. Every evening is different. Enjoy the many ways it was captured. For starters, however, the bridge connects the Tempe Center for the Arts with the northern side of the lake. At night it gets lit up. ISO 100, f/16, 13 seconds, at 32mm with Canon EOS 5D Mark III and EF24-105mm f/4L IS USM lens. ISO 1600, f/9.5, -0.5EV, 1/45 at 70mm with Nikon D7000 and 70-300mm Nikkor lens. ISO 100, f/11, 8 seconds, at 34mm with Canon EOS 7D and EF28-70mm f/2.8L USM lens. ISO 100, f/14, 1/250 at 75mm with Nikon D800 and 24-120mm Nikkor lens. Then Nancy Sams got fancy, or as our group might say, "a bit artsy fartsy"! I am sure she will have new admirers. ISO 400, f/4.5, -2EV, 1/30 at 57mm with Canon EOS 5D Mark III with 28-300mm lens. 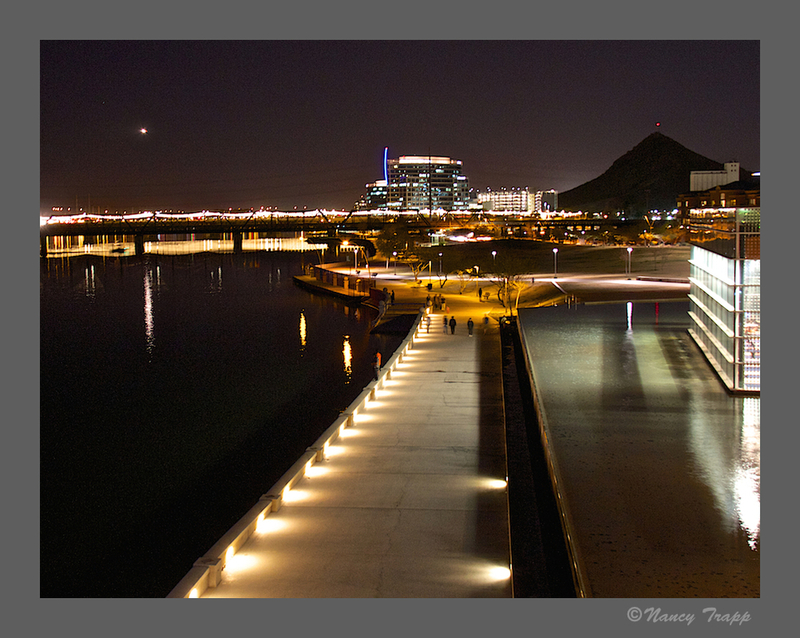 Then, we went upstairs inside the Tempe Center for the Arts and shot from the patio outside. Three floors. I have never been above the lake like that. Very nice. A whole new scene. "Scooch over please." This is when photography gets really interesting for me. The patio was small and the view was limited. 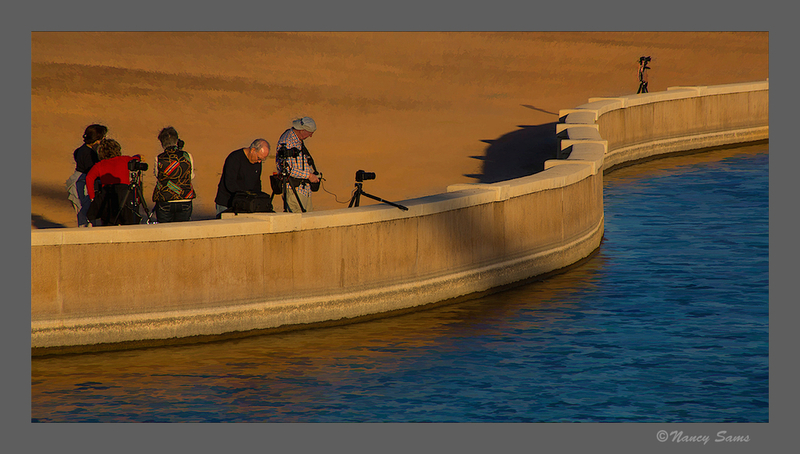 But, each photographer has their own take on what to shoot and how to get that particular shot. When I look at the collection I am aware that I did not see it so many ways. Pure magic!! ISO 100, f/11, 30 seconds, at 70mm with Canon EOS 7 D and EF28-70mm f/2.8L USM lens. ISO 400, f/9.5, 1.5EV, 4 seconds at 15mm with Nikon D600 and Sigma 15mm fisheye. ISO 100, f/7.1, 1 second at 24mm with Canon EOS 7D and EF-S 18-200mm f/3.5 lens. ISO 400, f/9.5, 0.5EV, 1.5 seconds at 15mm with Nikon D600 and Sigma f/2.8 fisheye lens. ISO 200, f/13, 13 seconds, at 70mm with Canon 5D Mark III and EF24-105mm f/4L IS USM lens. After all that fun, we followed it with more fun by having dinner together at a very nice restaurant called Thai Basil (on University)!